We don’t know what we did to piss them off, but the Gods have not been happy with us ever since we arrived in Greece. It couldn’t have been the lack of knowledge about Greek history; one Greek shopkeeper told Dante that he knew more about Ancient Greece than most of the population. Perhaps we’d been knocking on wood too much and not offering proper respect to Poseidon (God of the Sea) or Hephaestus (God of Metallurgy), but our troubles began as soon as we arrived in Greece. After an overnight passage from Bari, Italy, we made landfall in Corfu, Greece, and the windlass (used to lower and raise the anchor) stopped working. Now, you can anchor easily enough without an electric windlass – just use a winch handle to release the clutch. Pulling up chain, especially if anchored in anything more than 10 feet of water (where we’d have at least 40 feet of chain out), is tiresome to say the least. Moreover, it leaves us extremely vulnerable because it is difficult to pull up anchor and leave in a moment’s notice should conditions warrant it. Darold called the U.S., spoke with “the” guy from our windlass manufacturer and he gave us hints and recommendations for fixing it. Darold was worried the motor had burned out. But it turned out that the brushes needed to be cleaned. Darold performed physical maneuvers that would have made his chiropractor wince in order to access the windlass through as small cabinet at the bow in our forward berth and cleaned the brushes. Problem solved – at least for the time being. We spent some time in Greece making our way to the rendezvous point with our friend Erik and two of his boys. (For more information on our trip with the, see our blog post “Opa!”). We met up with them and started making our way south, as our plan was to make it to the oracle at Delphi, transit the Corinth Canal, and then anchor near Athens and tour the city. The Gods, however, had another plan for us. 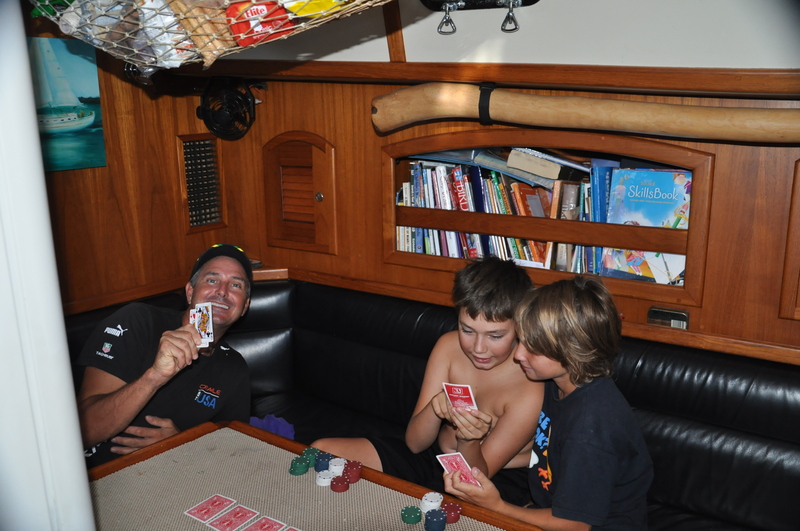 “We arrived in Corfu, Greece mid-morning after an overnight passage from Bari, Italy. Tired but excited to be in Greece we go to drop the hook in a beautiful anchorage near the old fort. But the windlass wouldn’t operate (this is the electric winch used to deploy/retrieve the anchor). So we did a quick manual anchoring. This bit of bad luck I brought upon myself by making the stupid comment to Jen as we sailed in to Corfu: “Hey this was a successful passage, nothing broke!” So after a quick cappuccino I was buried in the anchor locker cleaning the motor brushes. With that fixed it was time to dingy to shore for some ouzo and spanakopita. 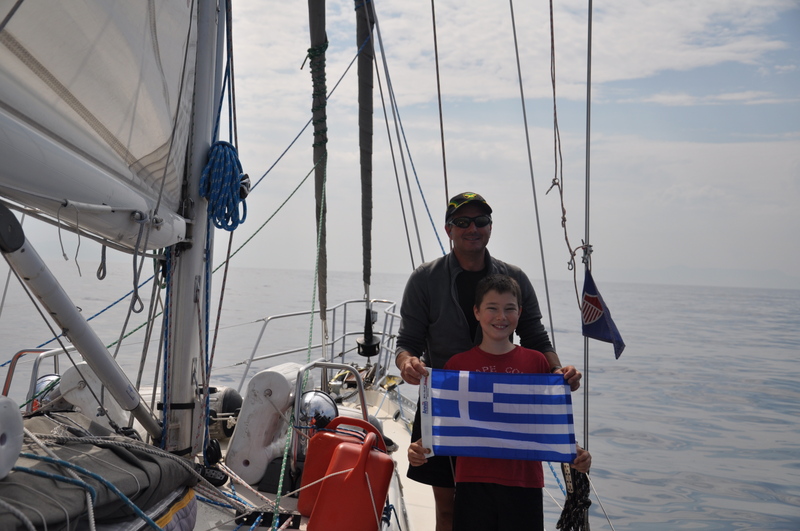 We had about 10 days to explore Greece on our own before the Blois crew would arrive (Erik, Lanse and Lukas). They also crewed for us in the Caribbean. A couple of days after they arrive we headed out to a remote anchorage for some swimming and hiking. After a very enjoyable several days it came time to head out and start making progress towards Athens. While checking the engine oil I noticed some transmission fluid. Further investigation revealed that the rear seal was leaking like a sieve and half the fluid was gone. Oh boy! Well at least we are a sailboat and can sail back the 25 miles to Nidri, on the island of Lefkas, where I can sort out the problem and get parts. Easier said than done. Benevento is a medium to heavy boat for her size at 14 tons. She doesn’t really start to wake up until the apparent wind is 15 knots and she loves 20 knots. That is her sweet spot. But we are in the Ionian Islands where wind here is as scarce as water in California! So we sailed off the anchor and headed back in a 5 knots – a light breeze. For most the day we had 2 to 7 knots, sometimes just drifting along a 0.4 knots. The problem was there were many islands along the way that we had to make sure we could clear should we have no wind. Fortunately, we always had just barely enough wind to safely navigate between the islands. In a pinch we could have dropped anchor or used our dingy (as a tugboat) to keep us safe. Well 13 hours later found us back at the anchorage, but not before one more challenge. At one point, another boat was crossing our bow and we had right of way. However, they either didn’t know the right of way rules, or ignored them. We had to change our tack to avoid hitting them as we yelled “We have the right of way! !” and lost precious momentum. They sheepishly shrugged and looked at us funny. As we approached our harbor the wind piped up to 25 knots. OK this will line up nicely with the channel to the anchorage. We’ll sail down the channel and drop the hook. But as we approached the channel the wind dropped to less than 5 knots. The channel is crowded with boats (some even anchored in it), water skiers, ferries, basically just polluted with boating traffic. The majority of the traffic is tourists and charter boats not paying attention. Can’t sail/drift down the channel with this much traffic and such little wind. So we headed back out into 20 knots, clear of any obstacles and traffic. Dropped the sails and slowly drifted while we lowered the dingy into the water and secured it to the starboard aft quarter of Benevento. Erik climbed in the dingy and motored us back to the channel and down to the anchorage, traveling a nice 3.5 knots. Plenty of speed to safely dodge the floating hazards. We dropped the hook in a very large and completely protected anchorage with excellent holding. After a few days resting there with the Blois crew, and trying to stay cool in the 100 degree weather, they cut their trip short with us a few days so they could explore the Greek sites we were going to do together. They need to get back to Athens to catch their flight home. So we began sorting out the gearbox trouble. So to make a long story short, the problem with the gearbox turned out to be an easy fix. 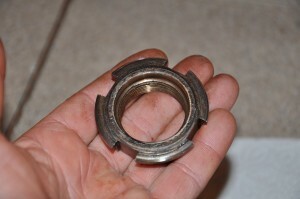 The nut which holds the output flange to the gearbox shaft came loose. Even though it is Loctite on, the Loctite after 15 years dried up and the nut has probably been working its way loose for many miles. Basically when in forward gear the nut tightens itself, but when in reverse the nut can loosen itself. This dance between tight and loose played out for many miles. It finally worked itself loose enough that while backing down on our anchor it came off allowing the shaft to pull partially away from the gearbox. This allowed the gearbox flange to pull out of the gearbox no longer making a tight fit with the rear seal, letting half the fluid out. An easy fix, but I needed to have a special tool machined for tightening the nut, which took more than a week. And we ordered a few parts (rear seal, locking nut O-ring). Unfortunately, our windlass failed again as we were leaving Lefkas to come to Italy. The motor is wearing out. It is 15 years old and just barely large enough to manage the weight of our ground tackle. AAAAAAH!!! Nothing like the feeling of danger and insecurity you can get with a non-working windlass. At least the anchorage in Siracusa is protected! We checked with the chandlery in town (from whom we had ordered some parts last time we were there), and they said they couldn’t order us a replacement. They could, however, get the clutch and brake cables that Darold needed to replace. He took the cables off the boat, essentially disconnecting our ability to maneuver the boat using the gear handles. Hs said that in a pinch, we could maneuver the boat in forward or reverse and accelerate from the engine compartment. That didn’t sound like fun. A few afternoons later we had a squall come through the anchorage and the wind got up to 50 knots. We braced ourselves to deploy emergency tactics and kept watch for other boats dragging down on us or our own anchor dragging. Fortunately, we didn’t drag and didn’t have to resort to those tactics. We cracked open a few more beers. We got our cables and Darold replaced them all. Meanwhile, he had researched what windlass he wanted to buy and contacted the manufacturer and a reseller. They were working on a quote and Darold let them know we might not have Internet access for a few days, as we planned to make our way toward Sardinia. It was a comedy of errors trying to get the windlass actually ordered. We take so many things for granted back at home. Including: having an address to send something to, and being able to use a credit card online. Try ordering an expensive part without being able to do either of those things. Let’s just say some very senior folks at Pay Pal got involved and we know the Gibraltar postal and customs system pretty well by now. Perhaps it was all of this work that appeased the Gods, but the gear box was working flawlessly. We’ll never know. Truth be told, there is always something to be fixed on a boat. But in the future, we might take a ferry to Greece.